To check the operation platform of the terminal. The operation platform of the terminal is an important piece of information during technical support (e.g. the version of core board, the firmware version, user capacity, product codes etc). 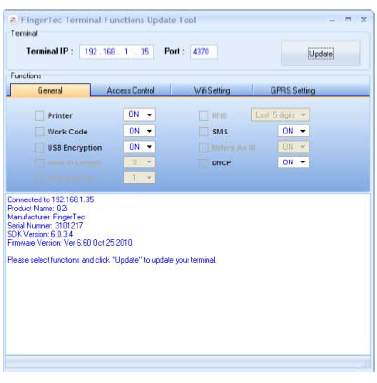 The FT Tool reads and displays all the information on a screen, and the support technicians will know more about the terminal, and be able to decide what solution to use. To disable/enable special functions in the terminal. WiFi and GPRS settings involves a lot of parameters, and a wrong value in the settings can cause the entire system’s downfall. In the case where normal users accidently meddle with the settings, technical support can check and re-configure them easily. 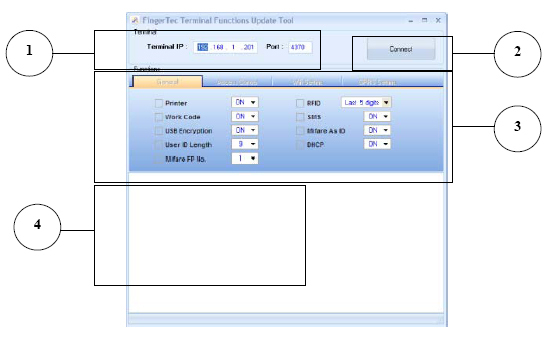 The FT Tool is a smart program, and it knows the functions that are compatible with the connected terminals. If the terminal does not support the function (e.g. TA100 cannot support access control) the function will be deactivated automatically. This is to avoid any mistake during upload process, thus minimizing hardware failure. The terminal can connect to a thermal printer via the RS232 cable to print a receipt (attendance reporting receipt) for users who have verified. Turn ON to connect to a thermal printer. The terminal allows users to insert work codes (2-digit number) as remark to their unusual attendance records. Select ON if you want to use Work Code. The terminal encrypts the content of data (user information and attendance records) when downloading into a USB flask disk. Select ON to allow terminals to encrypt the data during USB flask disk transferring. The terminal supports a maximum of 9-digit user ID, however the length of the user ID can be shortened to 5, 6, 7, 8-digit. Select the value to update to the terminal. A terminal that supports Mifare writes 1 fingerprint template into 1 piece of Mifare card during enrollment. However you can maximize the number to 2, 3 or 4 fingerprint templates into 1 Mifare card. Select the value to update to terminal. A terminal that supports RFID is able to read RFID cards to enroll and verify. However in case you do not want to use the RFID function, you can disable it by selecting NO. The terminal can display short messages (public and private) on the screen of terminal. Select ON if you want to upload this function to your terminal. A terminal that supports Mifare can opt not to write any fingerprint templates into the Mifare card, instead, the terminal only reads the number from Mifare card as a Card ID (similar to the RFID card). Select ON if you would like to use Mifare cards as RFID cards. You need to assign an IP address to the terminal for a LAN connection. However you can allow the DHCP server to assign an IP address to the terminal. Turn ON if you want to do so. To switch the Fingerprint algorithm version between VX9.0 & VX10.0 remotely using the tools. This page only applies to models that support access control features. You will see the page is deactivated if the connected terminal does not support access control features. You must install 2 units of access control terminals to support this function. Users must verify every time during entry or exit. In the event there is missing entry or exit records, the terminal will block users from opening the door. Select ON to use the function. The terminal always keeps a special log (False Log) in case of failed verifications. However keeping false logs consumes the storage capacity of the terminals. Only select ON if you would like to record how many times the terminal fails to verify users. GrpVer wt Timer – This is an enhancement of the Group Verification method. The terminal changes the verification methods according to time. Users need to verify using a different verification combo/ methods from time to time. Preset the date of holiday to the terminals, and assign time zone to limit the access during holiday. Turn ON if you want to control the accessibility of users during holiday. You must install 2 units of access control terminals then to use this function. It is a must for you to define to each terminal as Master or Slave. Do not assign both as Master or both as Slave. Our compatible terminals store door event logs (door open/close, door force open) into its memory, and you can download to view it in the software. However you can ignore these records by enabling this function. If you are using terminals with a 3rd party controller, select this option to set the terminal to signal an output User ID or Card ID as Weigand output. To turn the terminal record on & off for the Time Zone access deny log. To turn the terminal record on & off for the Anti Passback log. Set the suitable terminal setting to accept i-Kadex signal. To change IP Address of the terminal through Local Area Network. To Enable & Disable Signal to connect with Adaptec Plus. This page is only applicable to terminals that support WiFi. You will see that the page is deactivated when it’s connected to a terminal without WiFi feature.